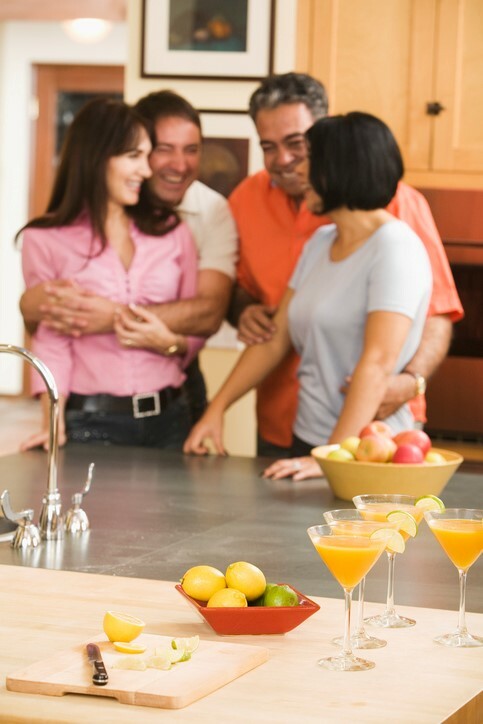 Imagine how much more enjoyment you would get from your home if you could remodel your kitchen? Picture yourself at a beautiful waterfall countertop peninsula island with friends and family all participating in meal preparation, enjoying a favorite beverage and discussing the events of the day – that’s priceless. Our prospective clients typically ask how much a new kitchen costs? The answer – it depends. The investment can range from a low of around $20,000 to more than $100,000. There are numerous factors that affect project cost. Moving walls, electrical, plumbing, gas and other infrastructure items behind walls will add to the price tag. Here’s how we create value and help assure that budgets are stretched to meet kitchen-remodeling goals. We start with the right layout. Kitchens not only have to be beautiful, they also need to be functional. The work triangle is a term used to describe the distance between the stove, refrigerator and sink. We design to make sure that this triangle has the smallest footprint possible. Typically, but not in all cases, we locate the refrigerator close to an entrance to the kitchen because the refrigerator is the most used appliance in the kitchen. Kitchen cabinets typically account for 35% of a remodel budget. Cabinets come in standard sizes, which leads some designers to believe that cabinets are not that interesting. We could not disagree more, and this is where homeowners who work with gifted designers can stretch their renovation dollars significantly. There is a wide array of cabinet options that come in standard sizes but can be tweaked to give a custom look without the custom price tag. Unless there is a space limitation, we can stretch renovation budgets by specifying taller cabinets that give our clients more storage space and options. The difference between a 36-inch and 42-inch wall cabinet equate to another shelf of storage space in the kitchen. The ability to identify a cabinet that meets your budget and aesthetic goals is one of the distinctive competencies of a professional showroom. We also know where the greatest returns on investments are in a remodel. One is to allocate more resources to the backsplash. Backsplashes account for a significant portion of the visual space in a kitchen. Plus backsplashes provide our clients with an opportunity to make a personal and unique design statement. Additionally, you don’t have to spend a fortune to achieve your goals. Little details matter a lot. Hardware for your cabinet doors and drawers is comparable to the jewelry you select when going out for a night on the town. It makes a huge difference but does not have to have a Tiffany price tag. You can make a striking statement with the right hardware. Lighting provides another opportunity to obtain a lux look on a limited budget. Lighting is primarily responsible for how your new kitchen will look and feel. When you compromise the quality of light, you compromise the entire project. Today, lighting technology offers unlimited options to create different moods and feelings every time you use your kitchen. Plus, pendants, chandeliers, under cabinet, in drawer in cabinet, under cabinet and well placed in-ceiling lighting offers another opportunity to express your individual style within a defined budget. Flooring represents an opportunity to stretch budget dollars as well. Large ceramic tiles installed diagonally give a rich impression. In kitchens with an open floor plan, we encourage our clients to use wood flooring that matches the rest of the house to provide a consistent look. Are you unsure if you have the budget to renovate your kitchen and achieve your goals? Please give us a call at 216.245.4522, or come to our showroom located at 26050 Richmond Road, Bedford Heights, OH 44146….We can provide you with a plan that meets your budget and your dreams.